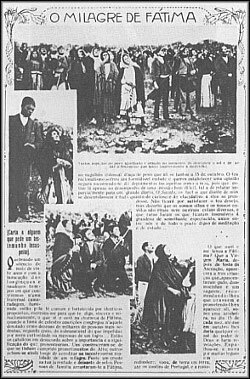 The story begins in the village of Fatima, Portugal, on May 13, 1917. On that fateful day near that tiny village, The Blessed Virgin Mary, Mother of God, appeared to three young peasant children: Francisco, Jacinta, and Lucia; ages 10, 9 and 7. As was the custom, these youngsters were tending their family’s sheep when “a Lady all in white, more brilliant than the sun… indescribably beautiful,” standing above a bush, appeared to the youngsters. 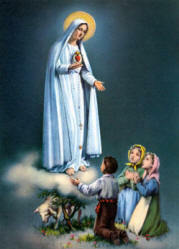 From May through October 1917, the Lady appeared and spoke to the children on the 13th day of each month. 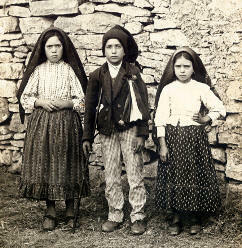 A picture of the actual Lucia, Jacinta, and Francisco.News of these apparitions began to spread throughout the region. The children recounted that the Virgin told them that God had sent her with a message for every man, woman, and child living in the century. She promised that God had sent her with a message for every man, woman, and child living in the century. She promised that God would grant peace to the entire world if Her requests for prayer, reparation and consecration were heard and obeyed. While many people believed the children had actually seen the Virgin, many others discounted the children’s story, subjecting them to much derision and ridicule. When it became known the Lady would visit the children for the last time on October 13, 1917, and had promised a sign that would convince the world she had appeared, many pilgrims made plans to attend. People fall to their knees during the Miracle of the Sun.Suddenly the “clouds separated…and the sun appeared between them in the clear blue, like a disk of white fire.” The people could look at the sun without blinking and while they gazed upward, the huge ball began to “dance”. The huge fireball whirled rapidly with dizzy and sickening speed, flinging out all sorts of brilliant colors that reflected on the faces of the crowds. The fiery ball continued to gyrate in this manner three times, then seemed to tremble and shudder, and plunge in a mighty zigzag course toward the earth. The crowd was terrified, fearing this was the end of the world. News report of the Miracle of the Sun.However, the sun reversed course and, retracing its zigzagging course, returned to its normal place in the heavens. All of this transpired in approximately ten minutes. After realizing they were not doomed, the crowd began ecstatically laughing, crying, shouting and weeping. Many discovered their previously drenched clothing to be perfectly dry.